I can claim victory! I made it all the way through May-hem without having to cry May-day! Woohoo! 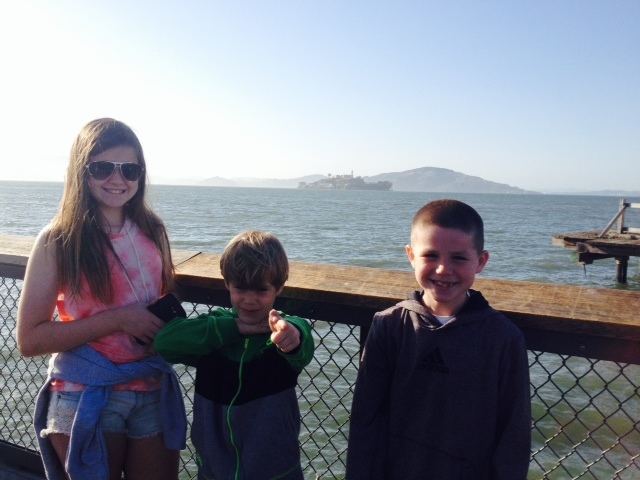 Part of what helped me push through the final week was the promise of a family vacation. After a week of exploring the San Fransisco, California territory, we will head back home. Ancient Redwoods, hippie beach towns, seaside aquariums, and nationally ranked college campuses, Team Hnath has managed to cram more in than a Survivor contestant winning a food challenge on day 36. We stayed with our good friend the kids call Cantina. (Our youngest couldn’t pronounce Cristina and, as all best ones do, the nickname just stuck.) We are fortunate that her home can accommodate the circus we bring anywhere we go, and more fortunate that she is willing to tolerate it. With two young boys in particular, the loud factor cannot be overstated. They. Are. L-O-U-D. If they aren’t blowing fart noises out of the sides of their cheeks, you hear crashing, booming, or cheering with every soccer kick, iPad play, or basketball shot. Shutting a cabinet door can sound like the 4th of July. But with some planning and lots of sideways if-you-aren’t-quiet-I-will-totally-send-you-to-Alcatraz-I’m-not-even-kidding-you Mom looks, we managed to keep the activities rolling, the kids entertained, and everyone sane, for the most part. In particular, I loved watching the three kids interact together in a way only possible when you get out of town. My daughter is now 13 and her interests have drifted increasingly further from those of her brothers. Gender is certainly not the only reason to blame here; age is also a major factor to this growing divide. When we are home, Emily has her group of friends with whom she spends time, so aside from soccer, the sport the children share in common, it is tough for all three kids to connect. When we are on vacation, they are forced to hang together and the results are great. I get to see my daughter giggle. Really giggle, without caring if anyone is watching, a rarity these days. And I relish every bit of it. Jackson, our youngest, keeps us all entertained with his one-liners and keen observations. His is the most unique mind and sense of humor I have come across and I always look forward to hearing what he will think up next. The only consistent thing about him is the fact that he will make some kind of goofy face in EVERY SINGLE photo we take along the way. So overall the experience has been great and I am sad to see it end tomorrow as we hop on a flight and get back to our lives in VA. There were only a few squabbles over seats, tears over toys, and fights over food. Oh, and the kids have been pretty good, too.